Want to listen to YES from your beloved one on the most awaited love day of the year i.e.Valentine’s Day? Then why wait and search here & there, get set go and send a Beautiful Valentine Quote with the illustration of a bird carrying a heart in its beak to your near and dear one. And I bet this will touch his or her soul by all the way coming to you in return 3 Magical Words….. I Love You, Be Mine Forever. 14th February, a day for loved ones is celebrated as VALENTINE’S DAY across the country as the feast of Saint Valentine. People often share flowers, gifts, and chocolates with their loved ones. This day is marked as a symbol of love when he or she expresses their immense love toward each other. Oh! The bird I want to put a letter in your mouth, Take my message with you for my beloved one; Happy Valentine’s Day! Love has no boundaries; it’s just a matter of glory and guts. 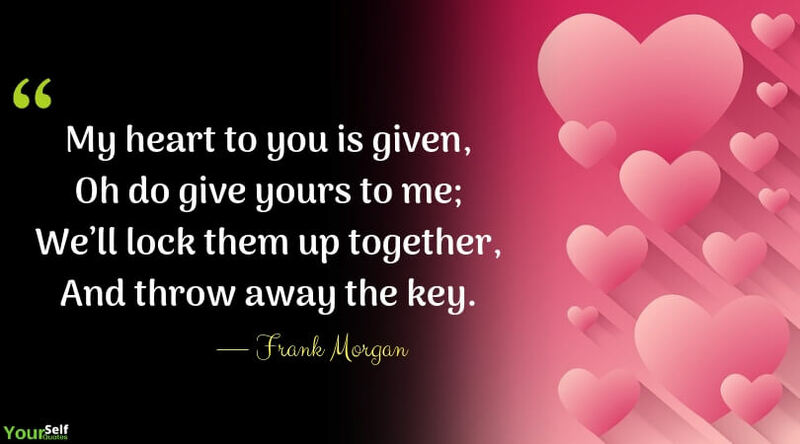 So, on this Valentine’s Day share your heart and this Valentine Quote 2019 with your beloved one and get in return his or her heart connecting with you forever. 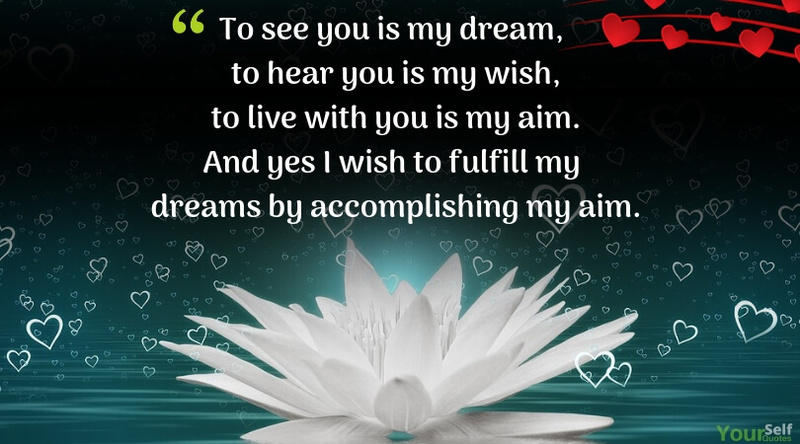 So, send a beautiful message to your love, friend by sharing the romantic lovely Valentine Quotes. Best Love Quotes That Will Make You Feel Love ♥ Yourself! “Roses are red and violets are blue, I’ve never been more in love with you!” Happy Valentine’s Day My Love..! “You Always Care For Me. You are a perfect life partner I could ask, You are my true soul mate, In my life, you play the most important part, Because you stay in my heart, Love you, my wife! Each and every day my heart is filled with love for you, but on Valentine’s Day, I just wanted to be sure to let you know it! I love you so very much. I cannot explain how happy you made me in the day you said that you accepted to be my girlfriend. That afternoon I felt I can touch the stars, I love you. I do not need more tests to find out if your love is what I needed in my life since we changed my life, my girlfriend. Happy Valentine’s My Love. I love you so much that I still remember the taste of our first kiss, the warmth of our first embrace, the perfume you brought that day. Happy Valentine’s Day. I am lucky to have a girlfriend who is beautiful, fun, smart, and crazy enough to go out with me. Happy Valentine’s Day!! My sweet Valentine, I promise to behave like a perfect gentleman this year and make sure to give you all you want on this special day, today it’s all about us and our love for each other. I love you! — Happy Valentine’s Day! When I am in love, it seems butterflies are flying in my stomach. The world seems so beautiful and full of colors that make my life full of ecstasy and joy that I reach to that level which I just dreamed of. Love is all that you and I need, and it holds enough power to conquer the whole world. When we are in love we desire, we wish, we dream, we want to live more & enjoy each and every moment spent with our loved ones. Yes. It’s true. Love is an ROI process, i.e. return on Investment. The day I felled in love I started investing time with each other so that we can ripen the sweet memories later on. In short, Love is Investment and Memories is Return on Investment. The whole year I have been waiting for this day to come so that I can express my heartiest feelings to you, and when this day has finally arrived it seems I have no words to express just only I wanna say Be Mine Forever. Sometimes I wonder that what I feel for you, do you also feel the same. But on this day of Valentine, I want to let you know that I feel special with you, I feel awesome with you. Oh! My beloved, on this day of Valentine I would like to thank you for filling my life full of love and surprises. Thanks for coming in my life and taking it to a level which was beyond my expectations. I am extremely blessed with God’s best creation that is You. I am thankful to God for sending you from heaven above to make my life a heavenly place to live in. Wish you a Very Happy Valentine’s Day my beloved Wife. On this 14th day of February a month of Love, I would like to share my deepest feelings with you. You are my moon, I am your honey, so why wait let’s plan for a second Honey-Moon. Happy Valentine’s Day My Lover!!!!!!!!! Feelings cannot be spoken, but what you feel you can express through your some magical words. 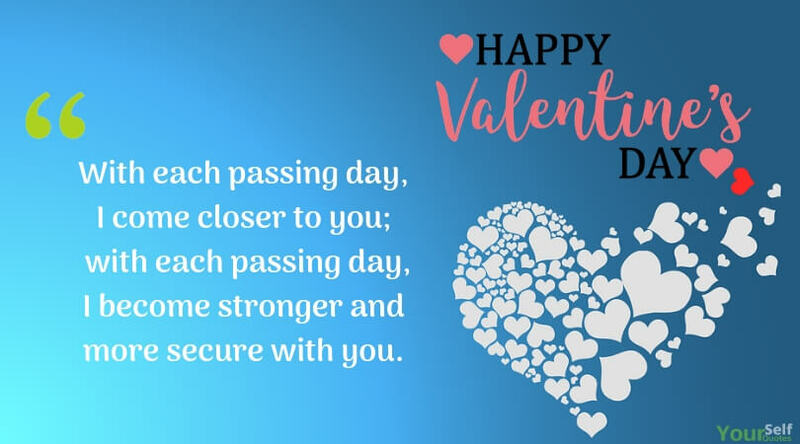 As we know Valentine’s Day is about to knock our doors, so be expressive by sharing Valentine’s Day Quotes with your loved ones. You will be the Valentine of Your Lover, and we will become your voice through our quotes. So be ready this 2019 Valentine’s Day to make your lover feel special like never before. So visit our website regularly to get access to unlimited quotes and wishes on Valentine’s Day for your loved ones. Yes, these are happy valentine’s Day quotes , nice collection.